Home Uncategorized Foam Finger: Has Vintage Josh Beckett Returned? 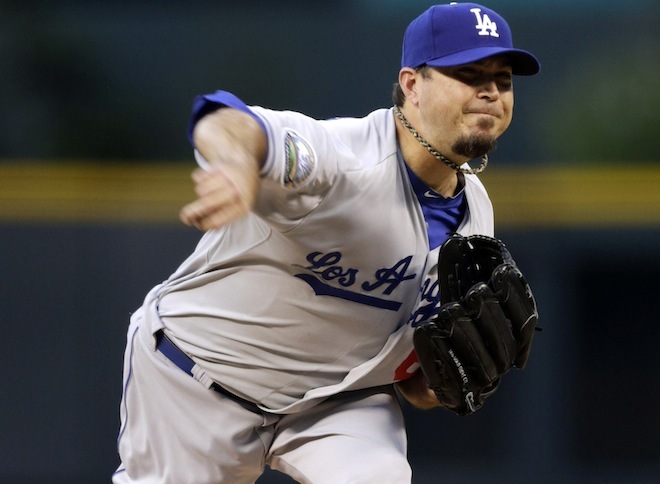 Foam Finger: Has Vintage Josh Beckett Returned? At 34, Josh Beckett doesn’t look a thing like the 23-year-old flamethrower who was named MVP of the 2003 World Series. He throws more off-speed pitches into the mix. He can’t consistently send a 95-mph fastball past hitters. But this Josh Beckett dominates all the same. On Sunday, he toed the rubber for the Dodgers and faced 30 Phillies hitters, and not one of them managed contact. The no-hitter was the Dodgers’ first since Hideo Nomo’s in 1996. It was also an improbable first in Beckett’s career. After all, this is the same Josh Beckett who won 20 games in a season only once in his career. The one who had a rib removed last July to relieve a nerve problem and only pitched in eight games during the whole 2013 season. The same Beckett that in 2011 was accused of drinking beer and eating fried chicken in the Boston Red Sox clubhouse along with several other lackluster pitchers. So naturally it was a surprise to see a new-and-improved version of Josh Beckett hold his own right up until his 128th and final pitch, when he struck out Phillies second baseman Chase Utley looking on a 3-2 fastball that painted the outside corner. Thing look pretty good right now for Beckett. He’s 3-1 this season with a 2.43 earned run average and has already thrown 12 more innings than he did all of last season. I don’t expect him to return to his previous glory. That 2003 Beckett ended the dynasty of a Yankees team that was appearing in its sixth World Series in eight years. He was an unknown who threw a complete game to cut the Yankees short of a game seven, and he was brilliant. My hope is that brilliance will be replaced with an MLB veteran’s wisdom. Beckett joked after Sunday’s game that he would have finished off his no-hitter if it meant throwing 200 pitches. But I think even he knows his body is not capable of that anymore. It’s hard to say if he’ll ever be able to completely earn the $15,750,000 he’s making this year. Sunday’s no-hitter, though, was an admirable start. It was a flash of promise for Beckett in a season where not much is expected of him. He should absolutely celebrate—just not with chicken wings and beer.